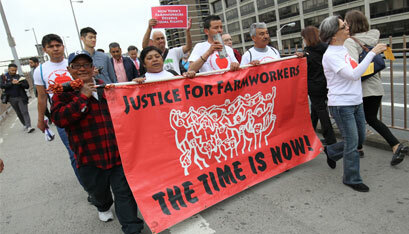 The New York State Catholic Conference is once again supporting state farmworkers. What if you worked at a job that had horrible pay, no overtime, dangerous working conditions and absolutely no way to address your plight? Welcome to the world of farmworkers in New York State. But the New York State Catholic Conference — which has supported the plight of farmworkers for the past 20 years — has once again thrown its support behind the Farmworker Fair Labor Practices Act, strongly urging the New York State Legislature to take action Tuesday. “Every one of us depends on our state’s farm workers for the food we eat, yet for too long we have turned a blind eye to conditions under which they live and work,” Bishop Edward B. Scharfenberger said. “These good men and women are not seeking special treatment; they simply ask that they no longer be excluded from the same rights and protections enjoyed by the rest of society. “My brother Bishops of New York State and I are proud to stand in solidarity with the community of farm workers from across New York, and we call on Governor Cuomo and the state Legislature to make the Farmworker Fair Labor Practices Act a priority so that, finally, these most basic protections, such as the right to overtime pay or a day of rest, will be enshrined in law. Justice and basic human dignity demand nothing less." Remember the last time you ate an apple? Harvested by a farmworker. Last time you drank a glass of milk? Milked by a farmworker. Yet they are excluded from workplace rights afforded by the Fair Labor Standards Act (1938) and the National Labor Relations Act (1935) . Poust says the bill would change that. The exemptions include: overtime pay, employer contributions to the unemployment; workers’ compensation funds; public health protections including sanitation and housing standards. The bill would end that and, in addition, grant farmworkers - most of whom are from Central America and Mexico - collective bargaining rights and would require that they be given a 24-hour day of rest in every calendar week which, whenever possible, would coincide with their traditional day of worship.